This meant that , when you search from https://www.google.com, websites you visit from our organic search listings will still know that you came from Google, but won’t receive information about each individual query. They can also receive an aggregated list of the top 1,000 search queries that drove traffic to their site for each of the past 30 days through Google Webmaster Tools. This information helps webmasters keep more accurate statistics about their user traffic. When the user’s search gets redirected to https://www.google.com , the user can have an end-to-end encrypted search solution between his computer and Google. This secured channel helps protect his search terms and his search results pages from being intercepted by a third party. This provides him with a more secure and private search experience. From the SEO perspective that means that the website owner will not get such keyword data as a result of which the visits were recorded. Google recommends the user to receive an aggregated list of the top 1,000 search queries that drove traffic to their site for each of the past 30 days through Google Webmaster Tools. This information helps webmasters keep more accurate statistics about their user traffic. Query: A list of the top search queries that returned pages from your site. CTR (clickthrough rate): The percentage of impressions that resulted in a click to your site, and the number of percentage points increase or decrease in the daily average CTR compared to the previous period. For example, if your CTR went from 40% to 30%, this column would show a change of -10. Average position: The average position of your site on the search results page for that query, and the change compared to the previous period. Green indicates that your site’s average position is improving. To calculate average position, Google takes into account the ranking of your site for a particular query (for example, if a query returns your site as the #1 and #2 result, then the average position would be 1.5). Such a depiction of data in SEO reports regarding keywords surely makes the website owner think from a larger perspective and focus on the correlation of content and keywords rather than rankings. This will take SEO campaigns above the metrics of keywords and rankings and the focus will be on other quality metrics like CTR , conversions, bounce rate, etc. which will improve the quality of the web overall as the websites besides being rich in content will have to focus on good landing pages, a proper call to action, page load speed and good navigation which will ensure a better UX . 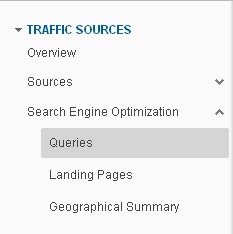 Search query data is now integrated within Google Analytics and the SEO Reports can have those metrics , data and details from analytics itself. When the businesses are at a loss for the complete keyword data the focus is shifted to the search queries in WMT which have a good CTR which is a true measure of quality over quantity. The percentage of the “Not Provided” data may vary from industry to industry but on an average should be in the range of 10 – 15 % currently but this encryption is trying to safeguard the privacy of the user and this way the website owners are also getting the accurate organic search data which is not influenced by personalized search preferences. From the SEO perspective the only thing affected is the reports which tell the website owner about how many people visited their site while they were logged in to their Google account in the form of the “not provided” keyword. This as mentioned earlier makes them shift their attention to the content and keyword correlation and CTR to the data available in the WMT for atleast the first 1000 queries. This widened focus will definitely ensure more quality content on the web and that is a good thing. I fail to understand why this made the SEOs attack Google with accusations , because according to me all these changes are drawing a clear, distinct line between organic search campaigns and paid campaigns and carving a niche for the SEO industry where the focus is on the holistic and overall quality aspects of the website rather than the cost paid for every click received.